This is the first of a series of postings we plan on showcasing our select dealers. Brick and mortar dealers provide the only local places you can try guitars like ours, in addition, they offer technical advice and service. In this case, we're highlighting a brand-new dealer in Tempe, Arizona. 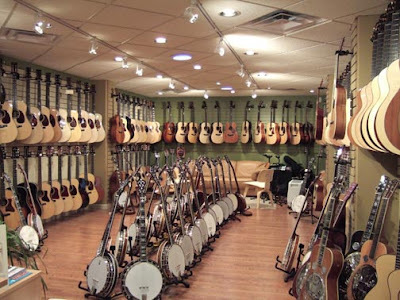 Acoustic Vibes Music is well-known as a high quality acoustic stringed instrument shop, and we're pleased to now have them representing us. We've just sent a new Signature model to Acoustic Vibes[Indian rosewood/double top spruce]. If you're in the area, please give owner, Jeff Looker a call to check out this exquisite guitar. Last August I played a few concerts and wrote about my Stand Up Model guitar, and it's time for an update. The prototype instrument that I had made at that time was (and still is) very exciting. I had previously worried that changing the body so significantly would somehow hurt the sound, but that first experimental guitar sounded so good, I wondered if the body changes weren't actually beneficial to the sound. The only way to find out was to build more, using various configurations of spruce or cedar tops, Brazilian or Indian rosewood back and sides. Now we've done that, and I actually have 5 Stand Up Model guitars in assorted flavors to try. What I was hoping to find is a sense of what these guitars have in common, both with each other, and with my standard Signature Model guitars. I have found out one thing — they're good! Very good! If you just grab the guitar and start playing the special Stand Up feature of the tapered body is not obvious, it usually has to be pointed out. If you use it with a strap, as it is designed for, the comfort and ergonomics of the instrument are instantly apparent. Most people adapt immediately. Also, as I've noted before, the ergonomic feature of tilting the guitar back toward the body that little bit is just as helpful sitting as it is standing. As for the sound, it is clear, loud, rich, sweet, well balanced, powerful and dynamic. That's all good. I don't really detect any problems, such as a loss of bass or other sacrifices. There just doesn't seem to be a downside. I don't expect any kind of majority of classical performers to embrace this challenge to tradition. I really began standing up to play just for myself. But I have learned that there are many players who share some of my experience that standing up can really benefit the player from the improved posture, and opens a whole new way of relating to the audience. Also for guitarists who work with singers, flautists, violinists and any other musicians who often stand up to play, it lets you perform on an eye-to-eye, more egalitarian basis. Over the next couple of weeks I'm showing these instruments to some great performers, teachers and dealers. If you're interested in these Stand Up guitars, please contact me soon. I don't think these will last long. 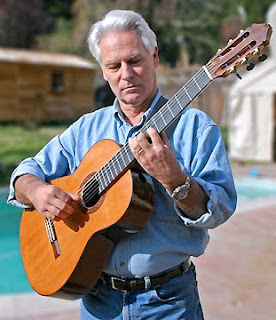 For electric or acoustic guitarists, standing up to play guitar is normal and not surprising. 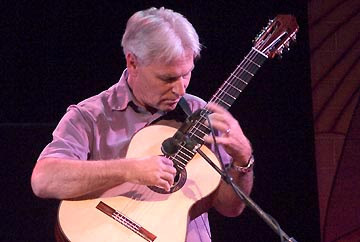 But for a classical guitarist rooted in the Segovia tradition, standing up and playing with a strap hints at some kind of heresy. For me, after sitting down with a footstool for something like 35 years, one day I just had enough. I found my old leather guitar strap from my bass playing days, and found a pair of strap buttons for five bucks at a music store, I drilled my guitar for the screws and I haven't gone back. At the time I had not been playing too much and I needed some real wood shedding to get back in shape, so with this new playing posture I went through my whole technique-building routine — scales, arpeggios, slurs, stretches, etc. I learned I that anything I can do sitting down, I could also do standing up. It actually only took a few days to get comfortable, and I have not gone back. 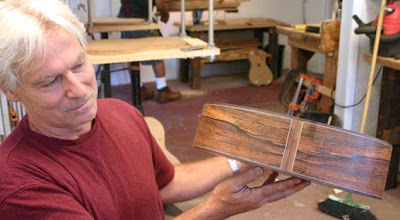 It wasn't long before I started thinking about the guitar itself, and I envisioned a way to improve the balance of the instrument by giving the body a taper from top to bottom, that is making the "treble" side wider than the "bass" side. This lets the guitar tilt back slightly, giving the player a little better view of the strings and fingerboard, and making the guitar hang against the chest with more stability and more comfort. It's a subtle change, but a comforting one. It also makes the same sweet ergonomic change for a player seated conventionally with a foot stool. Making such a major change in the configuration of the body of a guitar is pretty drastic. It changes the volume of air inside the box, and this messes with a major ingredient in the design of the guitar. In doing this I was just praying that I wouldn't hurt the sound of the guitar. To my relief both of the guitars I have done this to sound really great, and with the latest one I'm beginning to wonder if this new box configuration doesn't actually IMPROVE the sound. Wouldn't that be ironic? Standing up to play definitely improves my playing experience in a number of ways. It's immediately better for my lower back. After so many years of guitar posture I've had my share of aches and pains, and these are simply gone. Also, standing up changes your relationship with the audience, and with the room. It's easier to look around, your peripheral vision is much wider, it's easier to talk to the audience and look them in the eye. Of course this can be a mixed blessing, because under these conditions it can feel more vulnerable, and can expand the range of distraction for the player. But then again, vulnerable is not necessarily a bad thing for an artist, now is it? The freedom to move around on stage is a whole new world, and can offer another dynamic in relation to the audience. Especially if you're not using a microphone you can select your position on stage, and change it easily. I'm not thinking so much about doing the splits, or power slides across the stage, but even just stepping forward for a quiet, more intimate piece, or moving across the stage can give a different sound perspective to the audience. 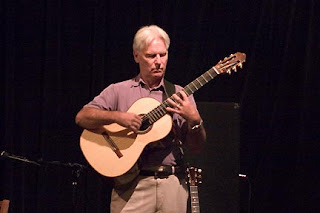 Standing up to play guitar can give greater authority to rhythm. Any bass player knows this. Rhythm is measured by the body, and the body is measured by the earth. 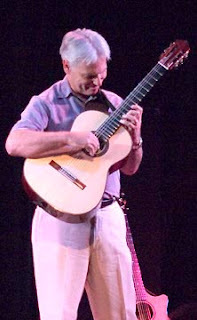 Standing makes a simple and direct connection between the basic force of gravity and the intellectual effort of guitar playing. The possibility of moving around to the music is more attractive with some than with others, but there it is, for each person, according to their gifts. I don't see myself ever going back. Now I use the strap even when I'm sitting down and practicing. I did have one old-time hard-liner tell me standing up to play "didn't look dignified" but I thought about how dignified I looked with my back spasmed out, needing help to get on and off the chiropractor's table, and I dismissed his concerns easily. I've made two of these tapered, Stand Up Signature Model guitars, and I will be making more. At least one of them is for sale now. I have no idea how well this model will sell, but for me in my playing, it's the only way to go. This unique left-handed Classic Crossover is presently available in the SHOWROOM. With all of the features of the standard Crossover, it was built specifically for the left-handed player with the cutaway on the left side. 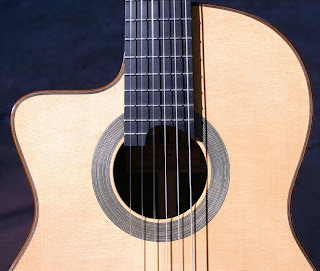 Perfect for the steel string player looking for a high-quality nylon string guitar with excellent acoustic sound and compatible playability: narrower neck, radiused fingerboard, marker dots, a traditional slotted peghead...all for a left handed player. This is a custom Classic Crossover 7 string featuring flamed maple back and sides. It was commissioned by and available through John Stewart's Fine Guitars in Columbia, Missouri. Designed with the steel string crossover player in mind, the Classic Crossover features a radused fingerboard and narrower 1 7/8" width fingerboard at the nut. fingerboard at nut- 2 1/8"
body length - 19 1/4"
body depth - 3 3/4"
We've made several of these for John Stewart in the past. We also now have an Indian rosewood companion made at the same time, which will be available for viewing and purchase in the SHOWROOM section of the website. Coming soon to the Showroom are a Brazilian Fleta, Cypress Torres and a left-handed Crossover.